The subject property is planted with rubber trees but the land is not maintained. It is located about 2.5 km north of Bukit Koman and about 500 metres off the main road. The neighbouring lots are all planted with oil palm. 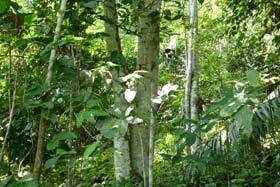 The undergrowth is too dense for us to get close to the rubber trees. 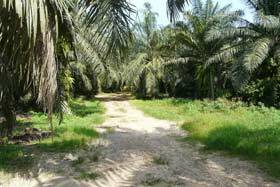 One has to go through this large oil palm estate to reach the subject property. There is an oil mill in this estate.